Underwater welders are essential to the petroleum industry, with workers repairing pipelines, offshore oil drilling rigs, and ships. They're needed to repair equipment and vessels that can’t be pulled ashore for routine maintenance. Underwater welding is a lucrative profession that offers the opportunity for travel and adventure, but it's also one of the most dangerous jobs in the world. 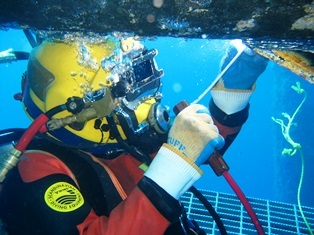 In fact, underwater welding has a 15 percent fatality rate. Underwater welders face constant risks due to operating dangerous equipment in dark places. Their injuries often lead to long-term health problems and even death. Shocks and explosions. Electrocution is a huge threat to underwater welders, requiring them to use specialized waterproof equipment at all times. Furthermore, underwater welding produces oxygen and hydrogen gases, which can cause lethal explosions when combined in concentrated amounts. Decompression illness. Since many underwater welders work hundreds of feet beneath the surface, they are subjected to dangerous pressure changes. Decompression illness is caused by a reduction in the ambient pressure surrounding the body. This results in two potential health risks: decompression sickness and arterial gas embolism. Decompression sickness is created by bubbles growing in tissue and causing local damage. Arterial gas embolism is due to bubbles traveling through the arteries and damaging tissue by blocking blood flow. Drowning. Differential pressure can lead to drowning incidents, and it's nearly undetectable until it's too late to escape. This phenomenon occurs when two bodies of water, each with a different level, intersect. The pressure difference can quickly amount to hundreds of pounds per square inch, trapping and drowning the diver. Diving gear failures, such as leaking masks, hoses, or oxygen tanks, can also lead to drowning. If you’ve been hurt due to an underwater welding accident, you deserve compensation for your work-related injuries. To learn more, contact the law offices of Steve M. Lee, P.C., by using the form on this page.